Have you ever complained that you didn’t “have time” for something? Perhaps you briefly considered a new habit or a new skill. You could start a meditation practice, or exercise more frequently, or *gasp* learn Spanish! Then, visions of your to-do list and calendar flashed in front of your eyes and you quickly dropped that idea. Nope, can’t, sorry. “No time”. I’d like to argue that you do in fact, have time. Perhaps it’s hard to see because it’s hidden away in little pockets throughout the day, but you definitely do have time. Taking advantage of this time can be a challenge because it’s so sparse, but it’s possible (and worth it). Using up those little pockets of time is sometimes referred to as N.E.T. (No Extra Time). It’s a concept created by Tony Robbins to explain how we can fully maximize the 24 hours in each day. Basically, it’s productive multitasking. While most multitasking is just heavily distracted single-tasking, there are occasions in which multitasking actually works. The catch is that one of the activities must be super easy and mindless. Your day is filled with more of that than you think! How much time do you spend in the car? Waiting in lines? Doing simple chores? Working out? All of these activities are opportunities to be doing two things at the same time. How can you fill up spare pockets of time? The best way to make good use of this time is to sit down and make a list of these mindless activities that you do. Then list some productive activities that you might be able to do alongside those. From there, it’s a matching game! Listening to a Spanish podcast while you commute? Perfect. Looking over your plan for the day while you wait for your breakfast to cook? You’re getting the hang of it! If you’re stuck, here are some ideas for both mindless activities and productive activities that you might pair up to achieve N.E.T. Replying to e-mails/messages/comments - Rein in your inbox by tackling messages that are easy to respond to. Reviewing your plan for the tasks ahead of you - Check out your to-do list and mentally prepare yourself to execute the next tasks to your best ability (and efficiently!). Taking a mindful moment to clear your mind - So many people claim that they don’t have time for meditation, but all it takes is a few minutes of simply focusing on your breathing and paying attention to your thoughts. That’s it - you’re officially meditating! Doing some simple exercises - No time for a long workout? While you brush your teeth or make your breakfast, challenge yourself to a set of squats. A little bit of exercise is better than none. Getting a small start on a big project - Big projects don’t have to feel overwhelming. Any little bit that you do will reduce the overall workload. Want to write a book? Write for 10 minutes while you’re sitting in a waiting room. Listening to a song that gets you energized - It’s one thing to mindlessly listen to the radio, but another to purposefully choose a song that pumps you up. Connecting with someone you care about - Send a check-in text or call to see how they’re doing. It doesn’t take much to keep up relationships, but it does take consistent, thoughtful effort. Stretching - It will not only loosen up your muscles, but it’ll help you think better. Take deep breaths, give your brain some oxygen, move around, and you’ll return to work feeling re-energized. Learning something - You can listen to a podcast, use a language learning app, watch a KhanAcademy video, etc. 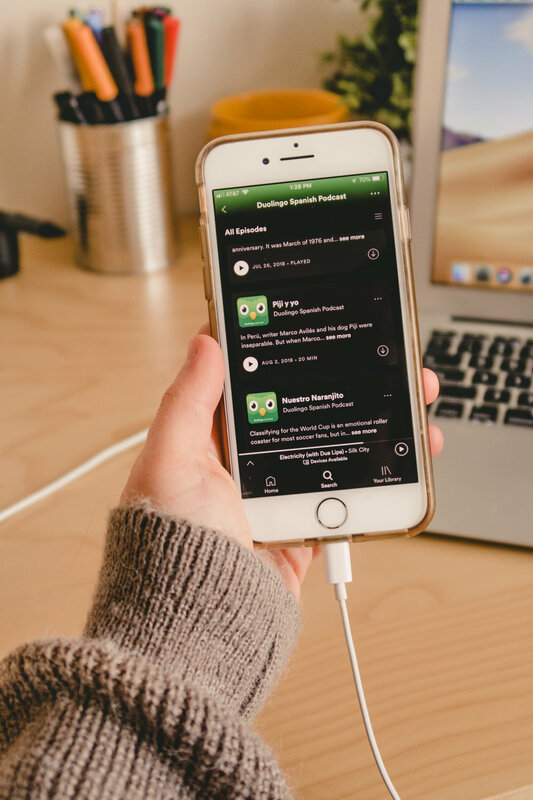 Listen to a podcast - Using apps like your phone’s native podcast app or Spotify. Learn a language - Using one of the many language learning apps that are out there - Duolingo, Memrise, Lingodeer, etc. Respond to e-mails or messages - Gmail, Facebook Messenger, Instagram, etc. Check your plan for the day - Take a look at your calendar (I use Google Calendar) or your to-do list (I use TeuxDeux). Edit photos - I usually have a few photos that I need to edit before I post them on Instagram so I’ll hop onto Adobe Lightroom Mobile to do that. Take a 1 Second Everyday video clip - Standing around waiting for something? Perhaps there’s a beautiful moment you could capture and add to your 1 Second Everyday video. Learn a word - Apps like Dictionary.com have “word of the day” features that you can use to expand your vocabulary. Study - If you’re a student, you can quiz yourself using apps like Quizlet. I often feel a little self-conscious when I pull out my phone in spare moments because I feel like I’m feeding the stereotype of smartphone-addicted teenagers. But what you’re doing on your phone is your business only. Focus on making the best use of your time and stop worrying what other people think! Another way that you can use up little pockets of time is by keeping a running list of small, easy tasks that need to get done. Keep it as a separate to-do list and pull it out whenever you find yourself with a few extra minutes to fill. That way, you can get the little stuff out of the way and save your longer chunks of work time for big projects that require a lot of focus and attention! I personally use TeuxDeux for task management, and it allows you to create separate lists in addition to your daily task lists. You could easily create a list specifically for this purpose. These little tasks won’t get in the way of your main to-dos, but you’ll be able to quickly flip back and forth between the two lists! Once you really put this concept into practice, you might find it kind of addicting to challenge yourself to use up every single minute thoughtfully. Throughout this process, I hope what you will learn is this - you are never too busy to do something. You are always in the driver’s seat. Instead of saying that you don’t have time for something, try saying “it’s not a priority”. It’ll remind you that you don’t just magically find time to do the things that matter to you. You have to make time. I want to know! How did you apply the concept of No Extra Time to your life? How did YOU hack the system and make extra time to accomplish things you never thought possible?